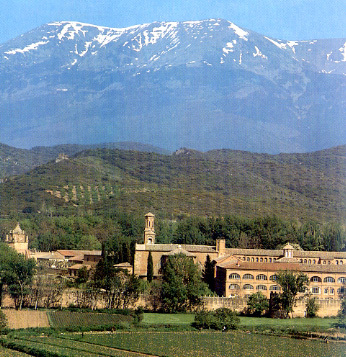 It was built in the 12th Century by the Cistercian monks at the foot of the Moncayo Mountains in Northern Spain. This monastery embodies the number, geometry and musical laws of "the Divine Proportion" as found in Pythagoras, Plato, Indic texts and oral cultures. It was here that Antonio de Nicolas received his spiritual training, and his education in the Greek and Latin classics before he discovered the same "divine proportions" in Indic, Greek and oral texts. In this case the fourth and the fifth came before the one, two, three of Plato in the Timaeus. Speaking across the flat white of a tablecloth, Antonio de Nicolas's recollections seem sprung from 50 lives. To hear him remember, his soft Spanish voice filled with the knowledge of living, is a kaleidoscope of time. "Every memory of every place is beautiful," he said. Stories of growing up in Castillian, Spain, of time spent in foreign embassies as an ambassador. Stories about studying in India, of living with and teaching the aboriginal tribes there, of going through acceptance rituals where to fail meant severed communication. There was this one time when the Pope (a friend) called him: "He asked me, 'Antonio, what can we do to Christianize Europe?' and I said, 'You're asking me? You talk to Him.'" You feel yourself drawn into a world of rapid experience. He's a poet, a writer, a translator, a world traveler; he has authored almost 30 books whose subjects encompass Oriental philosophy, historical reflection and education. Having studied in Spain, India and the United States, he received his doctorate in philosophy at Fordham University in New York and is Professor Emeritus of philosophy at the State University of New York at Stony Brook. Growing up, his first language was Spanish. He learned English, not only for professional and social reasons, but because it would strengthen his writing, having to convey thoughts in a different way, he said. several works of literature. Some of the most important, he said, are the works of Juan Ramon Jimenez, a Noble Prize-winning Spanish author and poet. William Abare, acting president at Flagler College, has met de Nicolas on several occasions. In fact, he enlisted de Nicolas to teach philosophy at Flagler for a short while when the school was searching for a new professor. "He came in on very short notice," said Abare. "He did a wonderful job -- he's a very capable teacher." St. Augustine is lucky to have someone like de Nicolas in the community, he continued. "He's a gifted scholar and an extremely knowledgeable person in his field. He brings a wealth of experience to the local community, and he seems to have an incredible amount of energy, a zest for living." In an odd coincidence, when Abare was interviewed he was reading "Habits of Mind: The Practice of Philosophy as education," a book de Nicolas wrote over a decade ago. The book has since been "adopted as the educational system for the new Russia," according to a press release. descendent of Ponce de Leon, Mario de Leon, who died 15 to 20 years ago. He never married, said de Nicolas, because he was once betrayed by a girlfriend who left him for the head of the opposition in the Spanish Civil War. A deep concern of de Nicolas's revolves around children: their educational needs; how their minds are being trained not to think, their creative abilities bound tight against growth. They are being abandoned, he says, not only in this county, which he has called home for 10 years, but throughout the rest of the world as well. "(The children) are brilliant, very gifted, but very abandoned." Throughout all his travels, everything he's seen, he decided to settle in St. Augustine -- he's now on his fourth house. He moved here so that he can think. "I lived life so fast, every step was totally fresh, new," he said. "I need time for reflection, time to write." De Nicolas believes that St. Augustine has the potential not only for physical but intellectual growth. "The mobility of the people outside is enormous," he says. "(St. Augustine) will be the retreat place of the world."